FYI, rifle stocks are used also to help steady the weapon against the shoulder for better aim. Yeah but a laser rifle probably wouldn't be aimed via traditional sighting anyway, right? It's got a bright, built-in laser sight! I'd assume it could be fired as accurately from the hip as from the shoulder. I'd assume it could be fired as accurately from the hip as from the shoulder. Um... hip shooting is definitely note as steady as pulling a weapon into the shoulder. Its kind of a biomechanical thing. That said, this is still just a game and not a reality simulator, and I think the graphics look really sweet. Doesn't matter if it has a laser sight or not (and there are already laser sights available). If you want to aim a gun the best way is to steady the weapon against your shoulder so that your eyes can follow the gun's sight (and make sure that the weapon is actually pointing towards where you want it to be) and the weapon itself is fired from a more stable position. Hip firing is usually only used as a last resort measure, i.e., if you are surprised in close quarters combat (and on which case getting the first shots is more important than aiming the weapon). "Firing from the hip is also stupid, even firing a machine gun from the hip is something only an amateur will do. Some machine guns, however, have too much kick to fire from the shoulder and must be fired from the hip in an emergency. When Rambo mowed down all the bad guys with an M60 machine gun in one hand I realized that the producer had no clue as to what he was doing. Hip firing is not accurate at all and is a great way to waste ammo. The only way it might be accurate is if the gunner 'walked' his rounds into the target by observing where they hit and adjusting his hold. Walking rounds into a target is only effective if the shooter has all the time in the world and the target is not firing back. Machine guns come with bipods and tripods for this reason, they are not meant to be firing without being braced on something solid." Hip fire may look good on videogames and movies but to my knowledge no real life military force would use it as a tactic. Well, a rifle without a stock is a pistol, isn't it? Perhaps a heavy pistol. Heavy pistols really strain the arms when used for sustained aiming. A shoulder stock really helps. Heh, I'm good at stirring up debate with off-hand remarks. 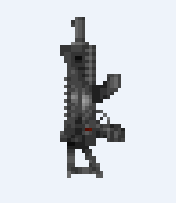 Added another version of the laser rifle, with stock re-added. Honestly it probably looks better that way anyhow, yeah? edit: Also, I hope ya'll noticed all the weapons have safeties. The alien apocalypse is no excuse for unsafe weaponry. Heh. Very well done graphics CryptoCactus! I like them a lot! I totally agree with the usefulness of the laser rifle stock, because a rifle stock is not only there to absorb recoil (which is none for a laser weapon) but to help aim the weapon in the desired direction, as it was already pointed out... But the "stockless" rifle graphic can be reused as a very nice "Laser Heavy Pistol"! 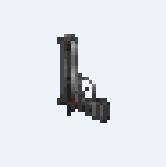 I would make the pistol grip one or two pixels thicker and here we go! 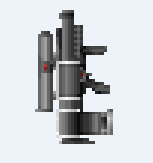 Was perusing some of the sprites from UFO2000, and was inspired by the laser weapons. So, introducing the laser family mk3. Also, had to zip up all the bigobs into an archive to attach them, as it seems 5 is the max attachments you can have. 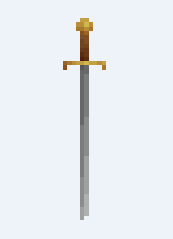 Made a bow and a sword 'cause lol why not.